Pulaski County, Missouri has a long and proud tradition of patriotism. In remarkable spirit, citizens laid their cash on the barrel head in return for Uncle Sam’s war bonds during several War Loan Drives to support the war efforts of World War II. War Loan Drives were held nationwide and Pulaski County stepped up to the plate. The third War Loan Drive was held from early September through early October in 1943 with a national goal of $15 billion and the county quota was $336,000. With Dru Pippin as the chairman from the county, Pulaski County delivered $341,787, almost $6,000 over goal. Adjusted for inflation the money raised by Pulaski County in 1943 would equal $4,604,621.64 today. $75,000 of the monies raised bought a P-51 Mustang which was named “The Spirit of Pulaski County” by local bond buyers. After purchasing a Series E War Bond the buyer was able to submit a naming suggestion. 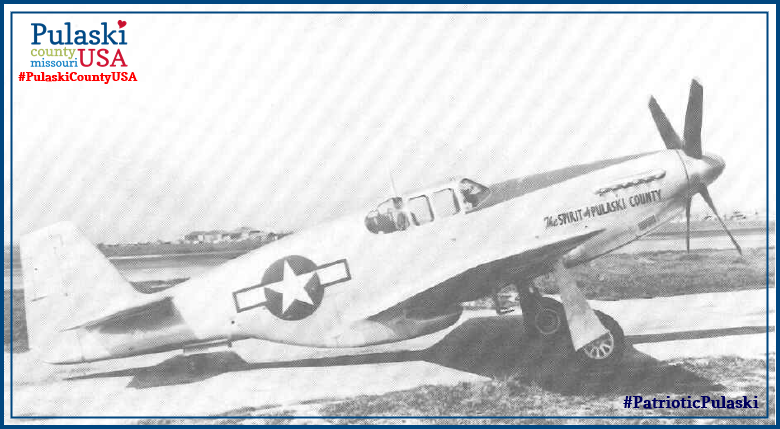 North American P-51 Bought with the 3rd War Loan Drive. “The Spirit of Pulaski County”. P-1 Mustang. Photo courtesy of Pulaski County Museum & Historical Society. Pulaski County, always patriotic and dutiful, had seen many of her citizens march off to war, but part of the rallying cry for the War Loan Drives was the memory of Wayne Lynn “Buck” Bandy. A graduate of Waynesville High School, Buck played trumpet for Navy Band Number 22, and was one of the many sailors lost on board the U.S.S. Arizona December 7, 1941. 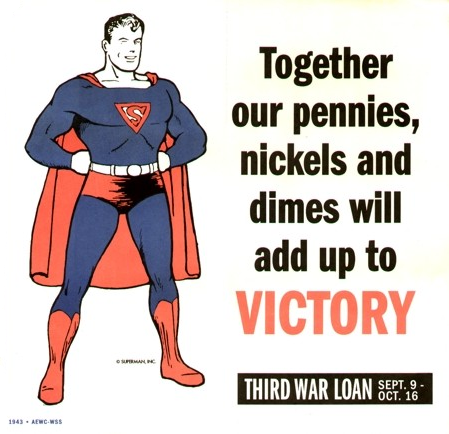 This Third War Loan poster featured Superman. Many businesses were advertisement sponsors for the War Loan Drives including Long’s Drug Store Sundries, United Army Store, Rigsby Service Station, Baker Hotel, Dr. C.A. Talbot, Owl Cafe, Clark’s Cafe, Chicago Military Store, Prewett Liquor Store, Bell Hotel, Bursons Cafe, Ford Cafe, Copeland Military Store, Sinclair Service Station, Blue Line Bus Service, Tut’s Cafe, Fort Wood Hotel, Ft. Wood Military Supply, 5% Beer Parlor, Safety Service Station and Bell Garage. 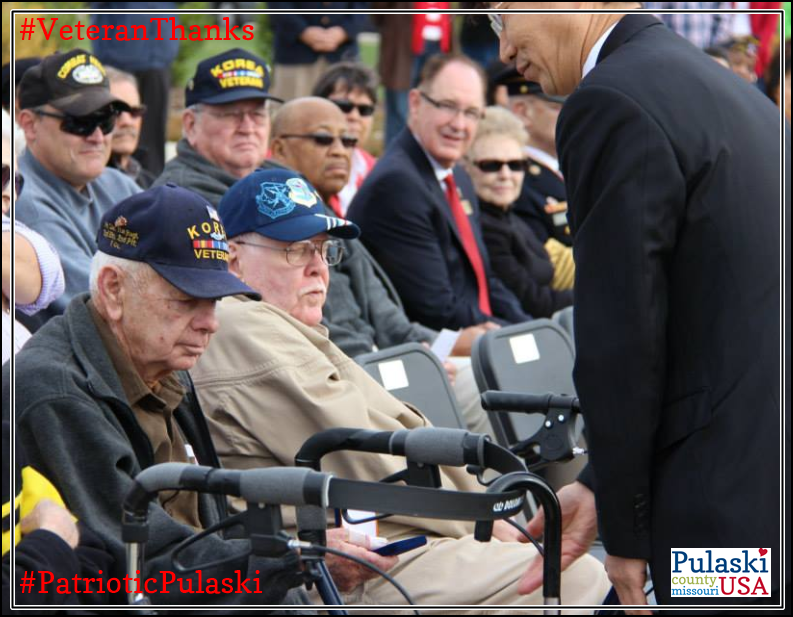 Today, over 70 years later, Pulaski County still fervently supports those who put their life on the line to fight for our freedoms. Pulaski County was the first Purple Heart County in the State of Missouri, and several of our cities have received the Purple Heart City designation as well. Special Thank You to Steven M. Beattie and Pulaski County Museum & Historical Society for their contributions and images. To plan your trip to Pulaski County, Missouri, home of Fort Leonard Wood, visit http://www.PulaskiCountyUSA, like us on Facebook at http://www.facebook.com/PulaskiCountyUSA, or order your FREE Official Visitors Guide at email@pulaskicountyusa.com or 877-858-8687. 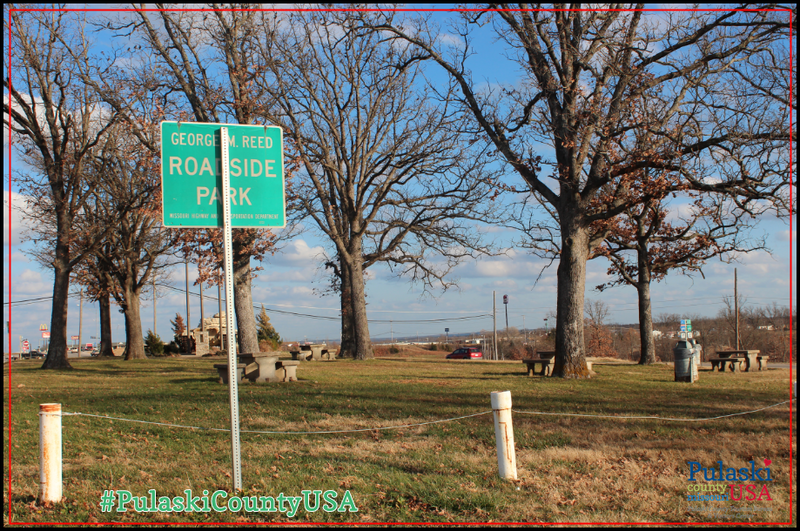 George M. Reed Roadside Park on Historic Route 66 in Saint Robert, MO is a throwback to a bygone era. Named after George M. Reed in 1952, this park is one of the last roadside parks on Route 66 in Missouri. Today’s traveler can make their Route 66 experience authentic with a roadside picnic lunch in the park! Don’t have fixin’s for lunch with you? Many of Saint Robert’s dining establishments offer carryout. Tip- Bring a camera with you! George M. Reed Roadside Park is home to a M-60 tank from the Desert Storm era. It is also a very popular place for Pokémon trainers! George M. Reed Park in Saint Robert is on of the last roadside parks on Route 66 in Missouri. 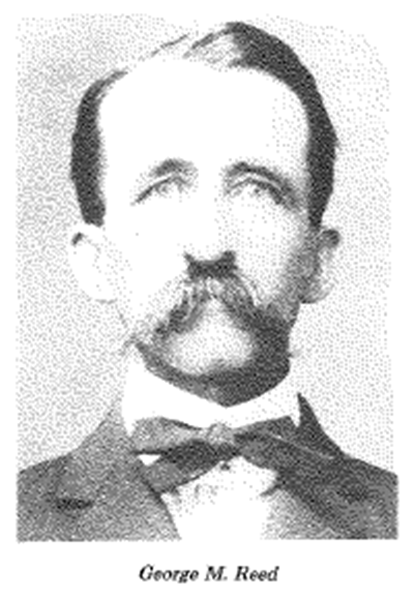 “George Marcellus Hamilton Reed was born near Kirbeyville, Brown County, Ohio on November 24, 1855, and died November 23, 1938 in Waynesville, Mo. He was the son of John K. Reed and Sarah Burdsall Reed. His mother died in infancy and he was reared by his paternal grandparents. He had one sister of full blood, Mrs. Ella Waite, two years his senior, who died July 21, 1934 near Iberia, Mo. At the age of eleven years he joined his father First Lt. John K. Reed and sister who had settled in Missouri after the Civil War. He was carefully schooled to young manhood when he returned to his grandparents in Ohio to study teachers training. At the age of twenty-one, he returned to Missouri. He taught school his first year at Hancock. Other school services were at Dixon and later Waynesville. During all of his teaching years he privately tutored students in violin. In 1882 he was associated with the late W.H. Murphy in the publication of the “Dixon News”. This newspaper was moved to Waynesville in 1885, and became the “Pulaski County News”. He remained with this paper six more years. In 1892 he was admitted to the bar under Judge C.C. Bland. He had begun studying law under his father, John K. Reed of Miller Co. When his father moved to Ava, Missouri, Mr. Reed finished reading law under J.L. Johnson. At the time of his death he was the oldest practicing attorney in this judicial court, both in age and in years of practice. Before taking the bar exam, Mr. Reed had become well known as a surveyor. In 1891 he was appointed County Surveyor and held this appointment until 1896. Since that time he has been held in the light of an expert due to his known mastery of mathematics. It was under the Presidential administration of Theodore Roosevelt and William Howard Taft, Mr. Reed was rewarded for being an active Republican. In 1904 he was appointed Postmaster of Waynesville and held the position for ten years. In 1919 he took charge of the highways in Pulaski County under the direction of the County Court. In 1921 he became Project Engineer, by appointment, for the State Highway Department. George Marcellus Hamilton Reed 1855-1938. Photo courtesy of Pulaski County Museum & Historical Society. On December 31, 1882 Miss Sarah Louella Hudson and George Marcellus Reed were married at Lebanon, Missouri. She was the step-daughter of the late attorney George W. Bradfield of Lebanon. To this union ten children were born, five, (including twins), dying in infancy and five living to maturity. Sarah Louella Reed died August 31, 1923. On March 13, 1925, he married Mrs. Sarah Farquer of Ohio, with whom he had attended school in his youth. Mr. Reed had been a Master Mason, and was a charter member and first Master of the Waynesville Lodge, organized 50 years before. His long Masonic service was duly honored on October 11, 1938 by the presentation of the fifty year Masonic Service emblem. He was from a long line of lawyers and Methodist ministers. 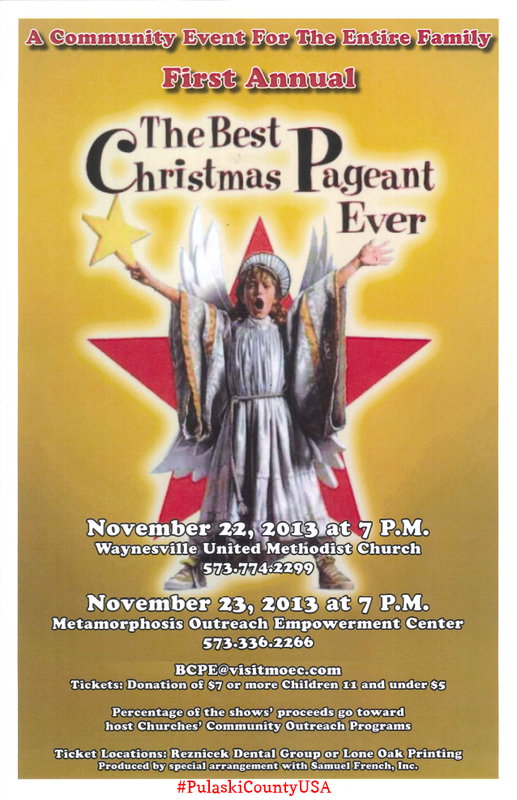 He helped erect the Methodist Episcopal Church in Waynesville. He and his wife were charter members, and faithful in servitude. The old home at the corner of Lynn and Highway 66 on the square was a center for the young. They gathered to sing, accompanied by the organ and at least two violins, sometimes a trumpet. 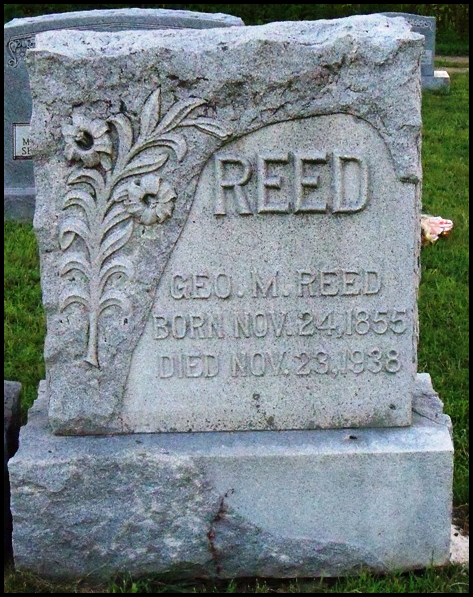 George M. Reed was laid to rest at Crocker Memorial Cemetery 25 November, 1938. Photo by http://www.findagrave.com. 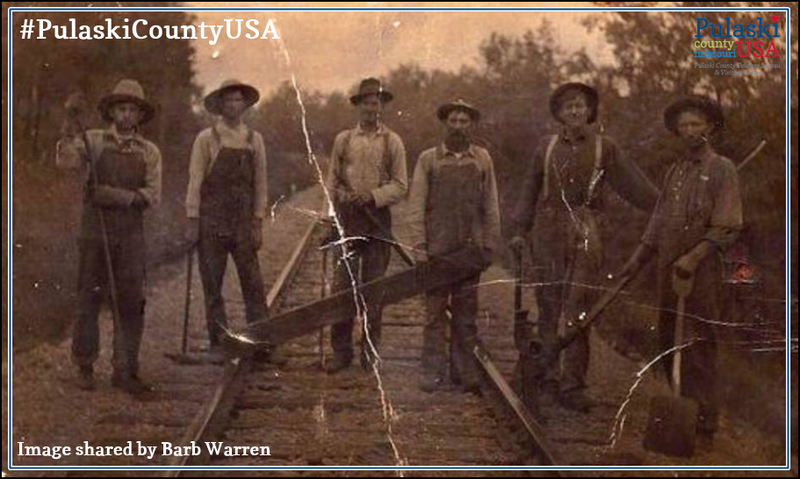 Today’s #ThrowbackThursday post pays homage to #PulaskiCountyUSA’s railroad history. Before the Civil War the railroad through Pulaski County, Missouri was planned to be through the southern portion of the county, the “low road”, south of Colby and north of Iron Ore. Those settlements do not appear on modern maps of Pulaski County. After the war, it was rerouted through the northern part because of terrain. It has been said that the northern route followed roads that were blazed by the Union & Confederate Armies. As the tracks made their way west new towns sprang up, “boom towns” that provided services to the railroad and became vital shipping points. In 1869 the railroad breathed life into Franks Switch, Dixon, Crocker, Hancock, Wood End (later Swedeborg), and Richland. The railroad changed the landscape of the area, as it brought towns to life, others fell out of favor, being just a little too far “off of the beaten track”. Such was the case with Humboldt. Humboldt was not directly on the new line and it gave way to the settlement of Crocker, which was named after Eurilis J. Crocker, a stockholder in the railroad. This picture shows railroad workers on the tracks near Dixon, MO. Today’s visitor and tourists can follow the history of what later become known as the Frisco Railroad as it winds its way across the “high road” of Pulaski County. To receive your complimentary Historic Auto Tour of the Frisco Railroad call 573.336.6355 today. This brochure also includes auto tours of historic Route 66 and Fort Leonard Wood. Railroad workers pose on the tracks near Dixon, Missouri in Pulaski County. Image kindly shared by Barb Warren. 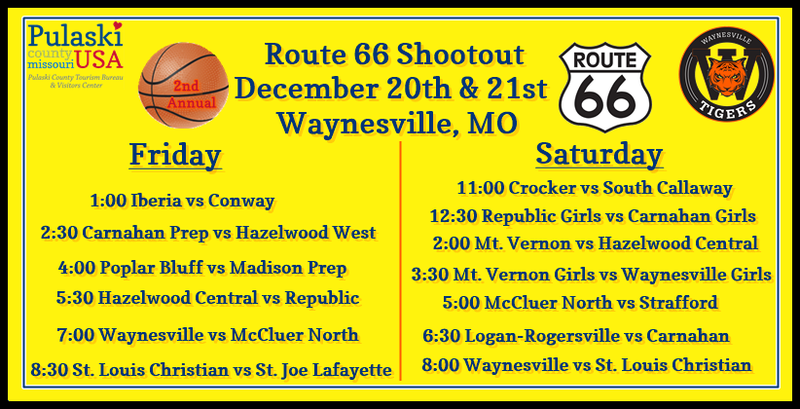 The second annual Route 66 Shootout Pulaski County USA will be held Dec. 20 and 21 at Waynesville High School with 19 teams playing 13 games in the shootout. 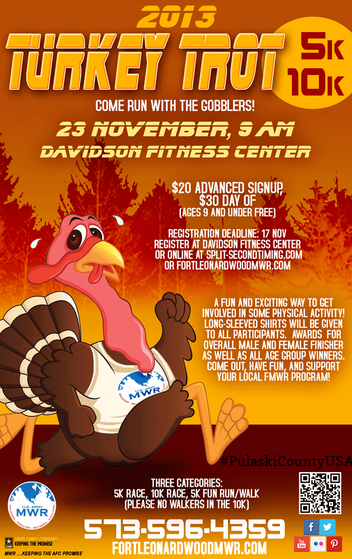 The Waynesville R-VI School District and the Pulaski County Tourism Bureau have partnered to produce this outstanding event. In addition to local teams, teams from Chicago, St. Louis and Kansas will participate in the unparalleled high school basketball hoops action. On Friday, Dec. 20, games begin at 1 p.m. with the final game of the evening starting at 8:30 p.m. On Saturday, Dec. 21, the games begin at 11 a.m. and continue to the last game, which begins at 8 p.m.
College recruiters will find places in the stands to study their top recruits. The cost for admission to each day of the shootout is $7 for adults and $5 for students. Athletic passes will not be accepted for this special event. Game programs will be for sale for $2 each. They cover the teams, their rosters, records, coaches, records and more. 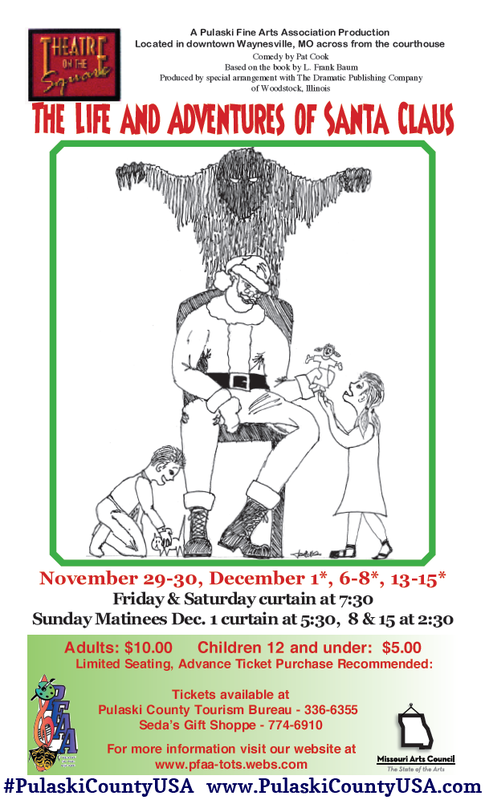 Pulaski Fine Arts Association presents “The Life and Adventures of Santa Claus” at Theater On The Square in Waynesville. 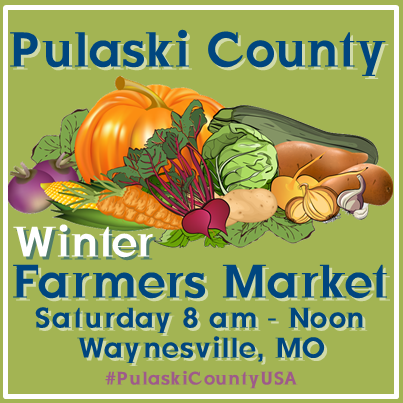 Pulaski County Farmers Market is held year round in Waynesville. 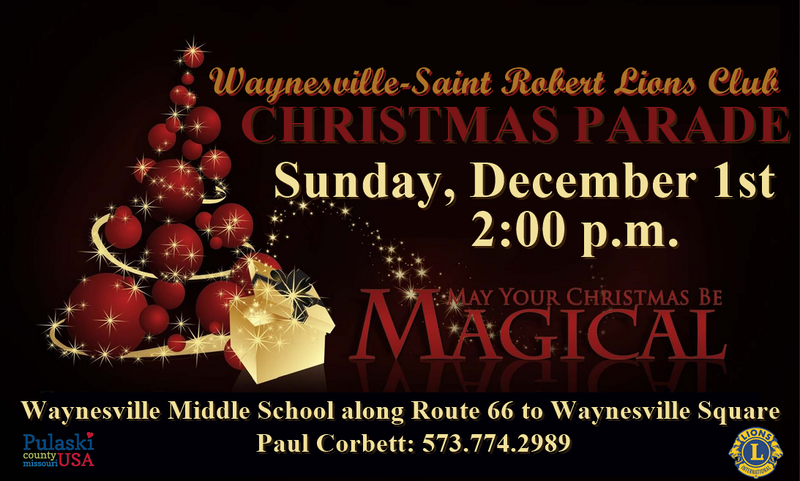 Waynesville-Saint Robert Lions Club Christmas Parade in Waynesville is a Route 66 enthusiasts favorite. 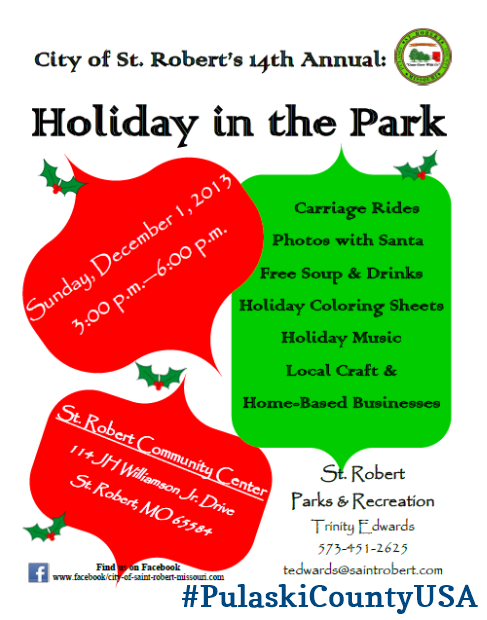 Holiday In The Park in Saint Robert has been a family tradition for more than a decade. Freedom Of The Road Riders Local 28 Chili Cook Off is a great way to warm up after the parade before heading to Christmas On Main Street in Crocker. 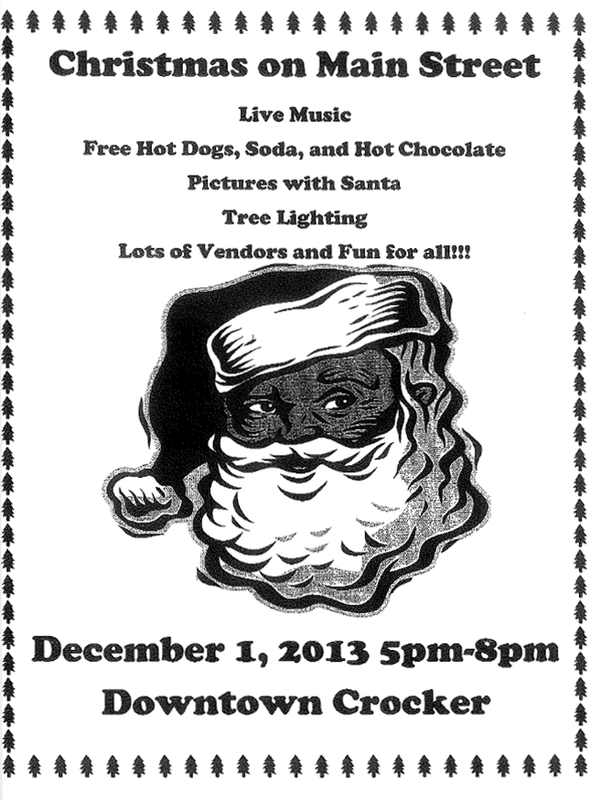 Kick off your Christmas season at Christmas On Main Street in Crocker. 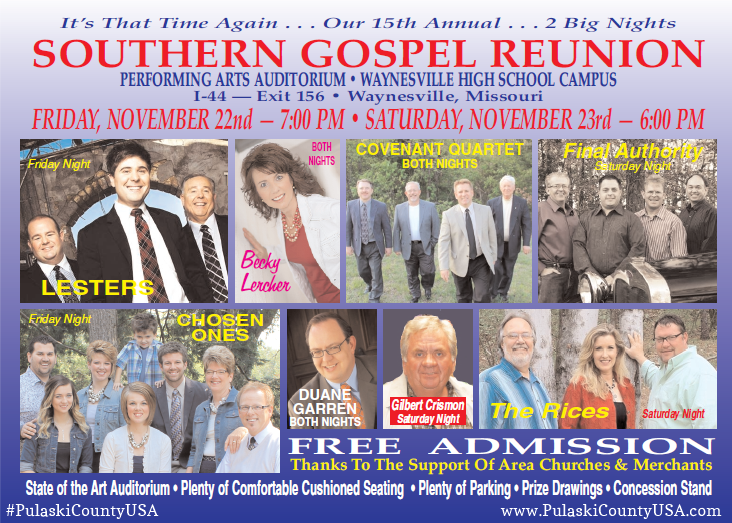 15th Annual Southern Gospel Reunion Flyer. 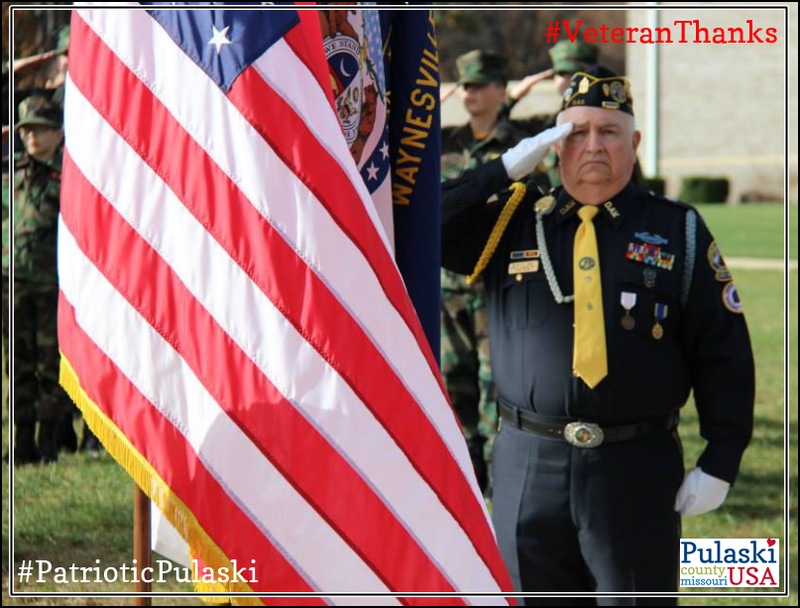 Patriotic Pulaski County has a long and proud tradition of patriotism. 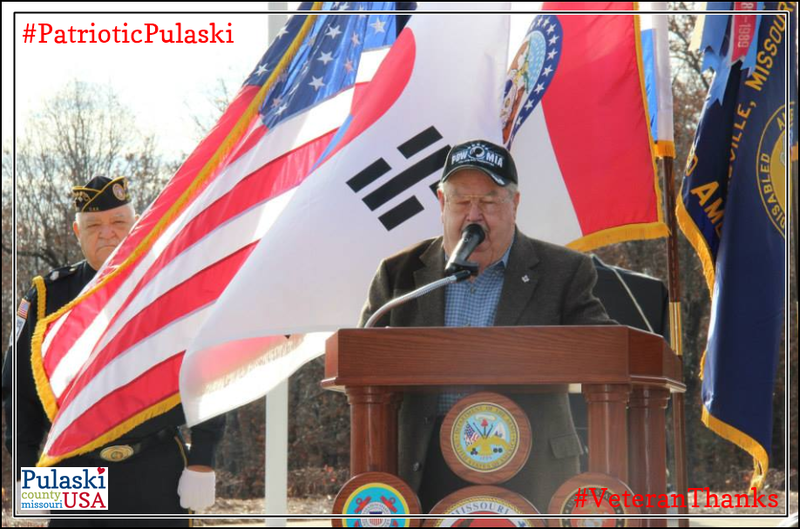 Another symbol of our patriotic pride was unveiled Monday, November 11, 2013 at Missouri Veterans Cemetery- Fort Leonard Wood. 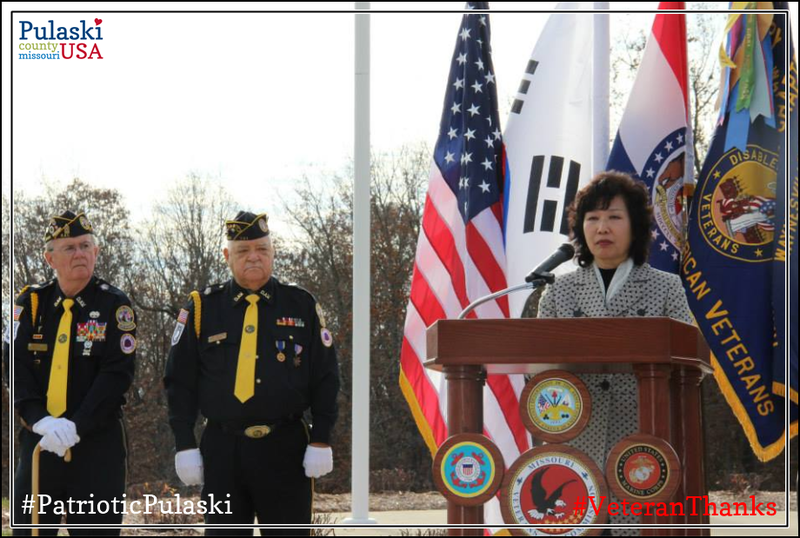 The Pulaski County Korean Association dedicated their gift, the Korean War Memorial monument to gathered onlookers and dignified guests in a ceremony that started at 9:00 a.m.. The Pledge of Allegiance was recited by attendees after the singing of the National Anthem of the United States of America and the National Anthem of the Republic of Korea. A member of Harry L. Herron Disabled American Veterans Chapter 49 salutes the American flag during the National Anthem of the United States of America. 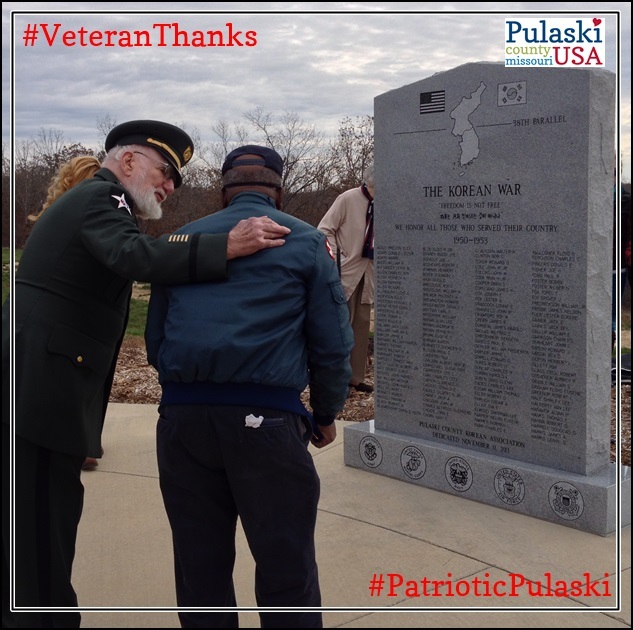 The monument is a tribute to the 358 soldiers from 62 counties surrounding Pulaski County that gave their lives during the Korean War. Speakers included Charles G. Baxter (Director, Missouri Veterans Cemetery- Fort Leonard Wood), 1SG (Ret.) 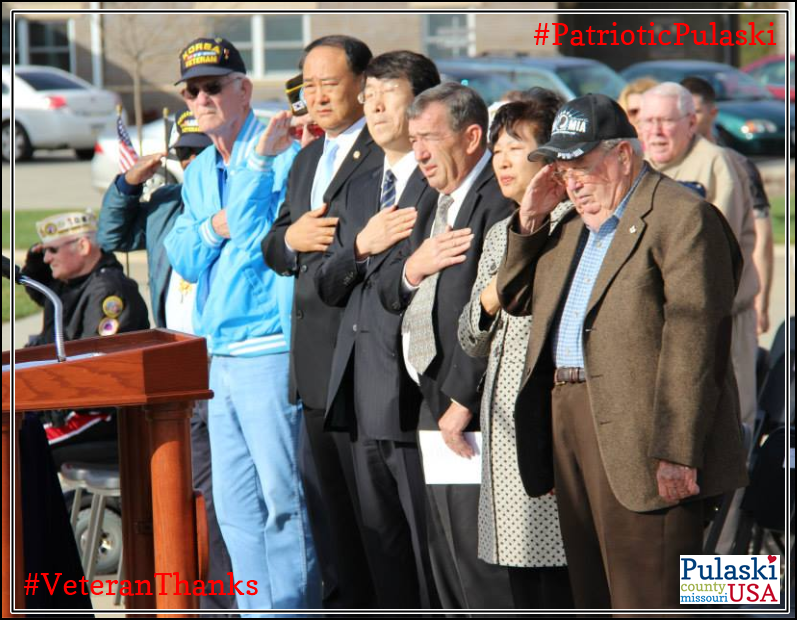 Walter B. Dixon (Former POW/MIA- Korean War), Kyong Rainbolt (President, Pulaski County Korean Association), Stan Baughn (Director, Missouri Cemeteries Program- Missouri Veterans Commission) and Jin-hyun Lee (Consul, Korean Consulate in Chicago). 1SG (Ret) Walter B. Dixon speaks about his experience as a POW during the Korean War. Mr. Dixon also recited some of his poetry. Mrs. Kyong Rainbolt, President of Pulaski County Korean Association spoke of her appreciation for those who served in the Korean War. Distinguished guests included Steve Lynch (State Representative District 122), COL Bjarne M. Iverson (Chief of Staff, Maneuver Support Center of Excellence- Fort Leonard Wood), CSM Terrence Murphy (Command Sergeant Major, Maneuver Support Center of Excellence- Fort Leonard Wood), George Sanders (Mayor of Saint Robert), Luge Hardman (Mayor of Waynesville), Dr. Virgie Mahan (President, Assistance Association), Members of Harry L. Herron Disabled American Veterans Chapter 49, and Pastors of Korean Churches. After the unveiling and acceptance of the monument Mr. Lee expressed appreciation for all those who served in the Korean War and Mrs. Rainbolt described the war as “America’s forgotten victory”. Both Mr. Lee and Mrs. Rainbolt reminded those in attendance that “Freedom is Not Free”. 60th Anniversary coins were presented to the Korean War Veterans in attendance by Mr. Lee. Mrs. Kyong Rainbolt & Mr. Jin-hun Lee moments after the Korean War Memorial at Missouri Veterans Cemetery- Fort Leonard Wood was unveiled. The monument is a gift from Pulaski County Korean Association. Photo by Daily Guide. After the monument was unveiled Mr. Jin-hyun Lee presented 60th Anniversary commemorative coins to the Korean War Veterans in attendance. Photo by Daily Guide. Governor Jeremiah W. (Jay) Nixon issued a proclamation that was read by Charles Baxter. 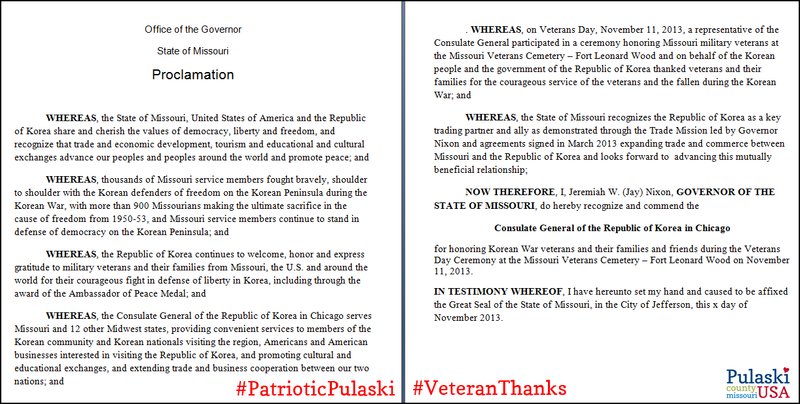 The proclamation recognizes that “trade and economic development, tourism and educational and cultural exchanges advance our peoples and peoples around the world and promote peace” and also commended the Consulate General of the Republic of Korea in Chicago “for honoring Korean War veterans and their families and friends”. Governor Jay Nixon’s Proclamation was read by Charles Baxter. The Korean War was fought from 25 June, 1950 until an armistice was signed by South Korea and North Korea 27 July, 1953. The United States sent 480,002 troops to aid South Korea against the North Korean invaders. Of these, the United States had 36, 503 casualties and 92, 073 wounded. The sacrifices made by American troops greatly helped South Korea and its people, and also helped to stop the spread of communism. Korean War Veterans gather around their monument at Missouri Veterans Cemetery- Fort Leonard Wood. The monument is a gift from Pulaski County Korean Association. 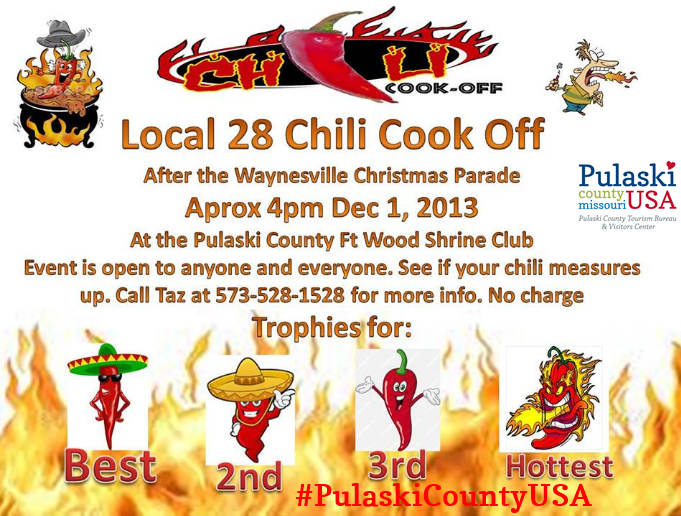 Photo by Pulaski County Tourism Bureau. 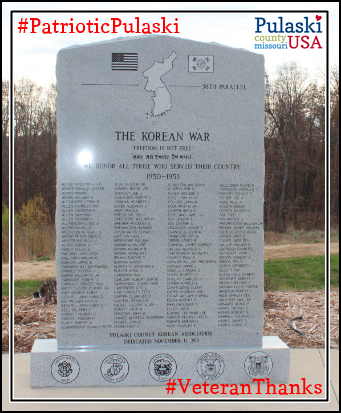 Pulaski County Tourism Bureau is proud to include this newest monument, a gift from the Pulaski County Korean Association as a stop on our Veterans Memorial Tour. This self guided driving tour directs visitors and tourists to nine tributes to our veterans that are in Pulaski County, Missouri. For your complimentary brochure call 877-858-8687 today. Korean War Memorial at Missouri Veterans Cemetery- Fort Leonard Wood in Pulaski County, Missouri. 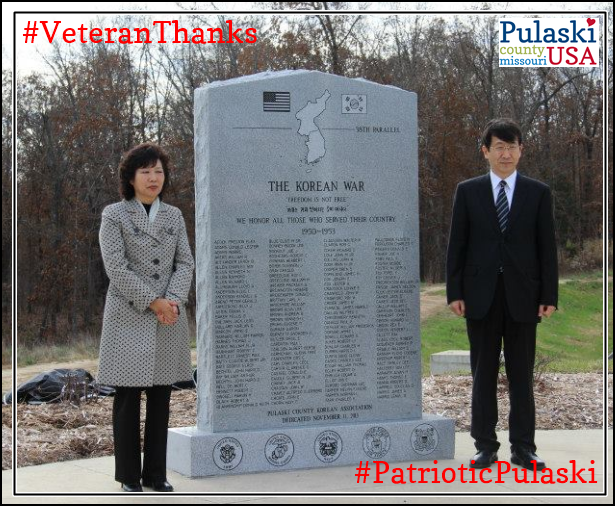 The monument is a gift from Pulaski County Korean Association. Photo by Pulaski County Tourism Bureau.